This is Chapter 1 of a Peak Oil Booklet I am working on, with the assistance of folks from TheOilDrum.com. Chapter 1: What Is Peak Oil? In this chapter, we discuss some of the basic issues relating to peak oil and the expected worldwide decline in oil production. 1. What is peak oil? “Peak oil” is the term used to describe the situation when the amount of oil that can be extracted from the earth in a given year begins to decline because geological limitations are reached. Extracting oil becomes more and more difficult, so that costs escalate and the amount of oil produced begins to decline. The term peak oil is generally used to describe a decline in worldwide production, but a similar phenomenon exists for individual countries and other smaller areas. 2. Why would oil production begin to decline? Can’t we extract oil as fast as we want, until it finally runs out, many years from now? What happens isn’t quite as simple as “running out”. Oil production in an oil field usually starts at a low level and increases as more oil wells are added. Eventually some of the older wells start producing more and more water mixed with the oil, and pressure declines. Oil companies do what they can to maintain production – drill new wells nearby, inject gas or water to maintain pressure, and apply other newer production techniques. Eventually, the proportion of oil in the oil/water mix becomes very low and the cost of extraction becomes very high. When it costs more to produce the oil than the oil is worth, production is abandoned. On a worldwide basis, the phenomenon of peak oil can be thought of as a crisis in resources needed to produce oil. It’s the size of the tap, not the size of the tank. As we deplete the large, easy-to-produce fields and move to ever-more-difficult fields, it takes more and more oil rigs, more petroleum engineers, and more investment dollars. Eventually we reach a point where we are out of equipment, out of trained personnel, and the investment cost for expanding production becomes prohibitive. When production begins to drop because of all of these pressures, we reach “peak oil”. 3. Aren’t we continuing to discover more and more oil every year? We often read in the news about finding new fields, but these fields tend to be smaller and harder to reach than those discovered in the past. We are now so concerned about finding oil that even small discoveries are reported as news. 4. Do we have any historical reason to expect that oil production will begin to decline at some point? 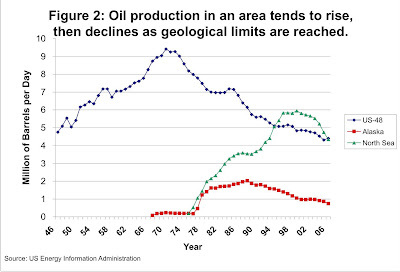 When we look at oil production in a given area, production tends to rise until approximately 50% of the oil that will eventually be extracted is gone, and then begins to decline. For example, Figure 1 shows oil production of the 48 states of the United States, of Alaska, and of the North Sea. Production in all these areas increases for a time, and then begins to decrease. We have now reached the point where oil production is declining, apparently for geological reasons, in the majority of oil-producing countries. It is logical to expect that world oil production will eventually begin to decline. 5. What does world oil production look like? 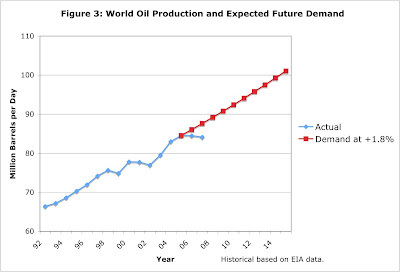 Figure 3 shows recent world oil production, plus a rough estimate of future demand for oil. The future demand line assumes prices equivalent to those in early 2005 ($50 dollars a barrel for West Texas Intermediate) and an adequate supply of oil. This price level was chosen because it represents the price before the recent stall in production and the resulting escalation in petroleum costs. It also reflects the fact that there are many current reports of oil shortages around the world. On this graph, a person can see that world oil production was rising fairly steadily, but recently has “stalled out”. Based on data of the United States Energy Information Administration (EIA), oil production for the 2005 to 2007 period is level or drifting slightly downward. Because of this “stalled out” condition, there is a growing gap between what the world would like for petroleum production and what is actually being produced. At this point, the countries that are suffering a shortfall because the current price is too expensive are mostly third world countries from Africa and Asia. The International Energy Agency (IEA) in June 2007 expressed concern that oil production is not high enough, and wanted Organization of Petroleum Exporting Countries (OPEC) to produce more. 6. Can OPEC raise its production of petroleum? Many people suspect that the answer to this question may be no. Some publications report that Saudi Arabia is having production difficulties, as are several other OPEC countries (Kuwait, Iran, Nigeria and Venezuela). Saudi Arabia does not admit to any production problems. EIA data indicates declining oil production for Saudi Arabia, even before OPEC production cuts were announced in the fall of 2006. It is likely that we will learn the truth about OPEC’s ability to raise production this winter. OPEC has its next planned meeting in September. Unless something very unusual happens, there will be a need for significantly higher oil production. OPEC’s actions at that time will tell what the real situation is. 7. Doesn’t OPEC report very large oil reserves? It seems like those high reserves would assure us that OPEC can increase its production at will. No, the high reserves aren’t all that helpful. First, there are serious doubts about the accuracy of OPEC’s oil reserves. The reserves are not audited numbers. Analyses such as this one suggest that the reserves are likely overstated. Second, even if OPEC reserves are accurate, the reserves tell us nothing about the flow rate. If the reserves include much very viscous oil, or if there are other production difficulties, it may take years to produce a relatively small flow of oil. One important piece of detective work regarding Saudi oil reserves was done a couple of years ago. Matthew Simmons analyzed published scientific papers relating to Saudi oil wells and determined that Saudi wells were reaching a serious state of depletion. He documented his findings in the book Twilight in the Desert. This book is now available in paperback, and has been translated into German and Chinese. 8. What is the pattern of world oil production in the next few years expected to look like? 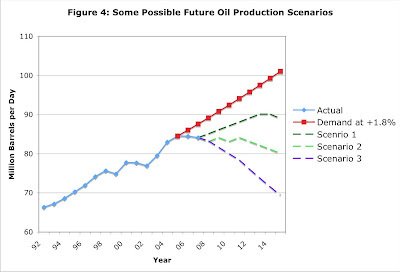 We can’t know for certain, but Figure 4 shows three possible oil production scenarios as dotted lines. If OPEC production is now falling, it is likely that we are at “peak oil” now, because production for the rest of the world is flat. If we are at peak oil, we might expect future oil production to follow a pattern similar to Scenario 3 (the lowest dotted line, with production falling immediately) or possibly Scenario 2 (the middle dotted line, with production falling after a plateau). Several respected energy industry insiders, including Matthew Simmons, energy investment banker and author of Twilight in the Desert, and Samsam Bakhtiari, retired Iranian oil executive, believe that we are at peak oil now. Scenario 1 (the top dotted line) shows a scenario in which peak oil is still a few years away. Some scientists believe that this is a more likely scenario. The Newsletter of the Association for the Study of Peak Oil and Gas forecasts peak oil in 2011, four years from now. The PhD thesis of Fredrik Robelius showed that peak oil is expected to occur between 2008 and 2018. Chris Skrebowski, author of the Megaprojects analysis forecasts a worldwide peak in 2011/2012. 9. When was peak oil first predicted? M. King Hubbert, in 1956, first predicted that US oil production for the 48 states would peak in 1970. This prediction turned out to be correct, to everyone’s surprise. He also predicted a worldwide peak around 2000. 10. Will alternative energy sources be able to make up for the shortfall in petroleum production? At this point, it seems unlikely that they will make up the shortfall. On Figure 4, the gap that needs to be filled is the gap between future demand (the top line) and actual future production (something in the vicinity of the dotted lines). Clearly, the sooner oil production begins to drop and the steeper the decline, the bigger the gap that needs to be filled. Even if oil production stays level, there can be a gap because demand continues to increase. None of these appears to be able to replace more than a small fraction of the oil we use, especially in a short timeframe. In addition, there are other drawbacks — cost, environmental damage, and for coal-to-liquid, climate change issues. Indirect approaches to circumventing the shortage, like using battery operated cars, may be part of the picture as well. If these are used, they will probably need to be phased in slowly, as existing cars are retired. It is likely that conservation will need to be part of the mix. PDF of Chapter 1: What is Peak Oil? This entry was posted in Introductory Post, Oil and Its Future and tagged corn ethanol, ethanol, oil, peak oil. Bookmark the permalink. 11 Responses to What Is Peak Oil? Brilliant article Ms. TverBurg. I hope you don’t mind if I copy some of your images and summarize on my own blog, with sources and a trackback of course? I’m always surprised that in discussions about peak oil, someone always brings up a link about how Peak Oil is a Myth because scientists say that we will never run out of oil. This seems to indicate that such posters haven’t understood peak oil theory because IT IS NOT ABOUT RUNNING OUT OF OIL. The oil companies and scientists are correct, the world will never run out of oil. Peak oil theory is about how production will decline as it runs into the wall of diminishing returns. When it takes a barrel of oil to produce a barrel of oil (EROEI) watch how fast our Canadian tar sands will shut down. Wishing you a very happy and prosperous new year ! It took 125 years to use the first trillion barrels of oil and 30 years to use the next trillion barrels of oil. The world has started to run out of oil. 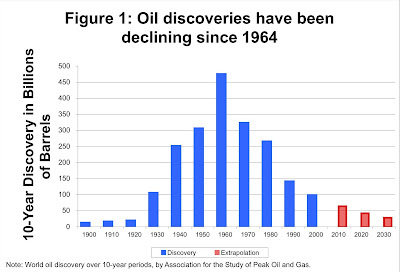 The last time that oil supply exploration exceeded usage was in 1981. For every barrel of oil discovered the world is using two barrels. The world supply depletion commenced in 1965 and there has been no abatement. It is likely that we will not be able to afford continuing to use oil before it dries up.